• Sensitive and accurate. Linear detection range 27 μg/dL (4.8 μM) to 1,000 μg/dL (179 μM) iron in 96-well plate assay. • Simple and high-throughput. The procedure involves addition of a single working reagent and incubation for 40 min. Can be readily automated as a high-throughput assay for thousands of samples per day. • Improved reagent stability and versatility. The optimized formulation has greatly enhanced reagent and signal stability. Cuvette or 96-well plate assay. • Low interference in biological samples. No pretreatments are needed. Assays can be directly performed on serum samples. Iron level in blood is a reliable diagnostic indicator of various disease states. Increased levels of iron concentration in blood are associated with blood loss, increased destruction of red blood cells (e.g. hemorrhage) or decreased blood cell survival, acute hepatitis, certain sideroachrestic anemias, ingestion of iron-rich diets, defects in iron storage (e.g. pernicious anemia). Decreased levels of blood iron may result from insufficient iron ingestion from diets, chronic blood loss pathologies, or increased demand on iron storage as during normal pregnancy. Simple, direct and automation-ready procedures for measuring iron concentrations find wide applications in research, drug discovery and environmental monitoring. BioAssay Systems’ iron assay kit is designed to measure total iron directly in serum without any pretreatment. The improved method utilizes a chromogen that forms a blue colored complex specifically with Fe2+. Fe3+ in the sample is reduced to Fe2+, thus allowing the assay for total iron concentration. The intensity of the color, measured at 590nm, is directly proportional to the iron concentration in the sample. 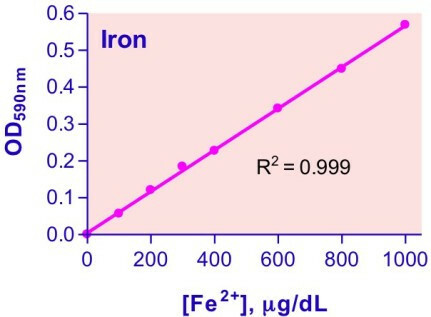 Applications For quantitative determination of iron ions Fe3+ and/or Fe2+ and evaluation of drug effects on iron metabolism. References Assay: Iron in Bacteria cell (Pubmed). 2. Raulfs, EC et al (2008). In vivo iron-sulfur cluster formation. PNAS 105(25):8591-6. Assay: Iron in Bacteria cell protein (Pubmed). 3. Bandyopadhyay, S et al (2008). A proposed role for the Azotobacter vinelandii NfuA protein as an intermediate iron-sulfur cluster carrier. J Biol Chem. 283(20):14092-9. Assay: Iron in Bacteria cell protein (Pubmed). 4. Shah, YM et al (2009). Intestinal hypoxia-inducible transcription factors are essential for iron absorption following iron deficiency. Cell Metab. 9(2):152-64. Assay: Iron in Mouse erythrocytes (Pubmed). 5. Sudarshan, S et al (2009). Fumarate hydratase deficiency in renal cancer induces glycolytic addiction and hypoxia-inducible transcription factor 1alpha stabilization by glucose-dependent generation of reactive oxygen species. Mol Cell Biol. 29(15):4080-90. Assay: Iron in Human tumor cell (Pubmed). 6. Anderson, ER et al (2011). Intestinal hypoxia-inducible factor-2alpha (HIF-2alpha) is critical for efficient erythropoiesis. J Biol Chem. 286(22):19533-40. Assay: Iron in Mouse serum (Pubmed). 7. Chen, H et al (2009). Changes in iron-regulatory proteins in the aged rodent neural retina. Neurobiol Aging. 30(11):1865-76. Assay: Iron in Rat Serum (Pubmed). 8. Zhu, W et al (2010). Genetic iron chelation protects against proteasome inhibition-induced dopamine neuron degeneration. Neurobiol Dis. 37(2):307-13. Assay: Iron in Human neuron cell (Pubmed). 9. Habel, ME, Jung, D (2006). c-Myc over-expression in Ramos Burkitt’s lymphoma cell line predisposes to iron homeostasis disruption in vitro. Biochem Biophys Res Commun. 341(4):1309-16. Assay: Iron in Human lymphoma cell (Pubmed). 10. Yokosho, K et al (2009). OsFRDL1 is a citrate transporter required for efficient translocation of iron in rice. Plant Physiol. 149(1):297-305. Assay: Iron in Plant rice (Pubmed). 11. Chen, H et al (2009). Dysfunction of the retinal pigment epithelium with age: increased iron decreases phagocytosis and lysosomal activity. Invest Ophthalmol Vis Sci. 50(4):1895-902. Assay: Iron in Rat serum (Pubmed). 12. Ringseis, R et al (2010). Low availability of carnitine precursors as a possible reason for the diminished plasma carnitine concentrations in pregnant women. BMC Pregnancy Childbirth.10:17. Assay: Iron in Human plasma (Pubmed). 13. Hamlin, F, Latunde-Dada, GO (2011). Iron bioavailibity from a tropical leafy vegetable in anaemic mice. Nutr Metab (Lond). 2011 Feb 3;8:9. Assay: Iron in Mouse serum (Pubmed). 14. Waheed, MM et al (2011). Some Biochemical Characteristics and Preservation of Epididymal Camel Spermatozoa (Camelus dromedarius). Theriogenology. 2011 Jul 13. Assay: Iron in Camel Epididymal fluid (Pubmed). 1. Zhang, Y et al (2010). Diphthamide biosynthesis requires an organic radical generated by an iron-sulphur enzyme. Nature 465(7300):891-6. Assay: Iron in Bacteria cell (Pubmed).